This study focuses on the reclamation work being performed on two former acid-generating tailings sites, located in Quebec, Canada. At both sites, the tailings were partially oxidized due to extended exposure, and the pore water is acidic. The reclamation solution applied to control acid mine drainage is a monolayer cover, made of non acid-generating tailings in one case and a till in the other. The goal of this project was to assess the response of the tailings-cover systems under various conditions. Tailings samples were collected in situ and characterized in the laboratory. Large column tests were conducted to evaluate the hydrogeological and geochemical behaviour of the covered tailings following wetting and drying cycles. The instrumented columns were designed to reproduce some of the existing site conditions and provide representative results for longer term analyses. Volumetric water content, suction, and oxygen concentrations were also monitored over time. The experimental data were used to validate different numerical models including those constructed with Vadose/W (GeoSlope Int.). Additional simulations were conducted under field conditions to evaluate the effect of various influence factors such as the depth of the water table, climatic conditions and the thickness of the cover. 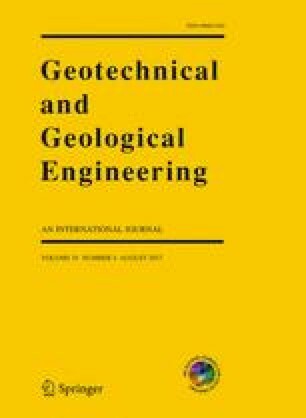 The combination of experimental and numerical results show how the behaviour and efficiency of a monolayer cover placed over reactive tailings depend on these factors, highlighting the importance of hydrogeological properties and water table depth. In many instances, the cover materials were prone to desaturation, especially when the water table was deeper than about 2 m below the tailings-cover interface. These results tend to indicate that relatively thin monolayer covers would not be able to prevent oxygen ingress under some of the conditions observed in the field. Desaturation of the cover and/or reactive tailings is due to a combination of drainage and evaporation. In such cases, increasing the thickness of the monolayer cover only has a limited effect. A discussion follows on the practical implications of these laboratory experiments and the numerical simulations for field design of reclamation measures at these two tailings impoundments. This research was supported by the Natural Sciences and Engineering Research Council of Canada (NSERC) and by the partners of the Industrial NSERC Polytechnique-UQAT Chair in Environment and Mine Wastes Management (2001–2012). Additional support is also provided by the FRQNT and the partners of the Research Institute on Mines and Environment (www.rime-irme.ca/en).